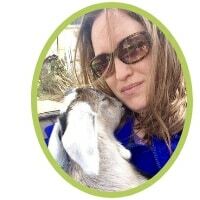 Do you have a crazy goat lady in the family? Are you a goat lover yourself? 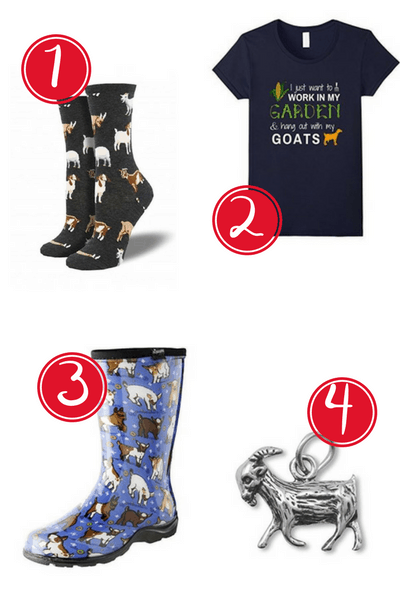 Here are 12 super cute gift ideas for anyone who loves goats! Who wouldn’t want to cozy up on the couch in these goat socks?! I wouldn’t even want to cover them up with boots to go out and play with the goats! Show your crazy goat side with this t-shirt. 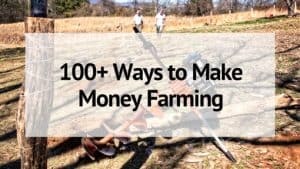 It’s perfect for anyone who loves gardening AND goats! All I want to do is work in my garden and hang out with my goats. If that’s not true, I don’t know what is! Goat boots?! What’s not to love. I’ve got a pair of chicken sloggers, but I am seriously considering putting these goat sloggers on my list this year too! I am not one for flashy jewelry, but this goat necklace is simple and pretty. 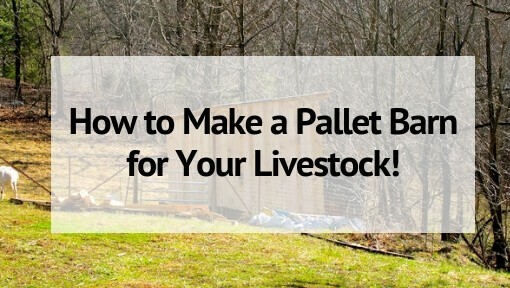 A great way to dress up your barn clothes! While you are cozied up on the couch in your goat socks and shirt, why not de-stress with this goat themed adult coloring book. Gather the family and share the goat love! The Goat Lords card game is the perfect gift for the goat lover to share with everyone. We’ve got Exploding Kittens- but we all know goats are better than cats! Do you have to have your coffee before heading to the barn each morning? Why not drink it from this cute goat mug? I am 2 goats past normal….I think I left normal in the dirt a long time ago! Beware of dog? How about Beware of Goats? Proudly post the sign next to the goat yard or even hang in as part of a goat-themed home decor. Do you love to make goat’s milk soap? Why not stamp your homemade soap with this super cute Goat’s Milk stamp and give your soaps a little something extra! I love baking sugar cookies- and now I can make goat shaped ones! This cookie cutter is so cute, and the perfect gift for the goat love that also likes to bake. 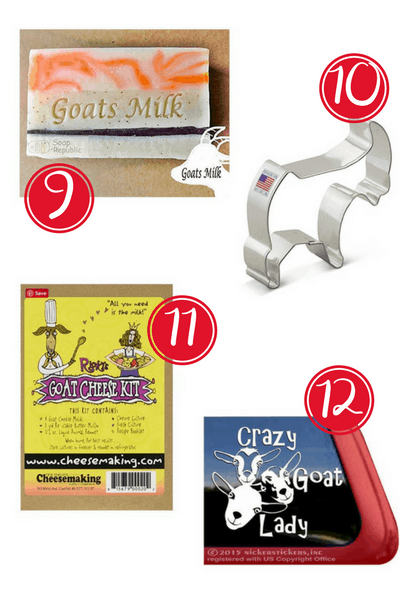 This kit contains everything you need to make goat cheese- molds, cultures, cheese cloth, thermometer and book! And you get fresh goat cheese from it! Proudly show your crazy goat lady side with this Crazy Goat Lady Decal. Use it on your car, your window, your laptop- anywhere you feel the need to show your love of goats! And there you have it! 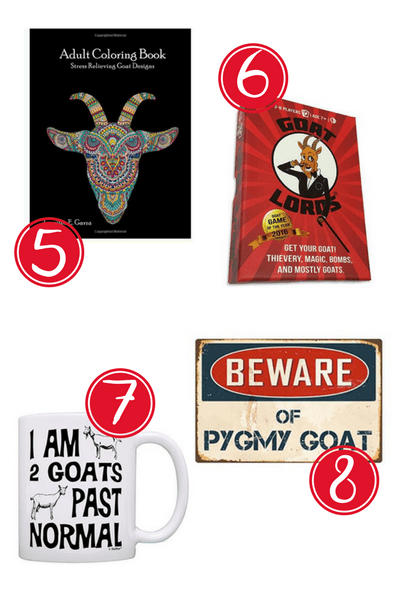 12 cute gift ideas for goat lovers- or to put on your gift wishlist this year! 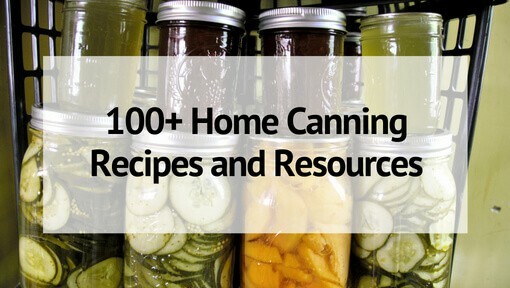 Related Reading: The Clutter Free Gift Guide for Kids!